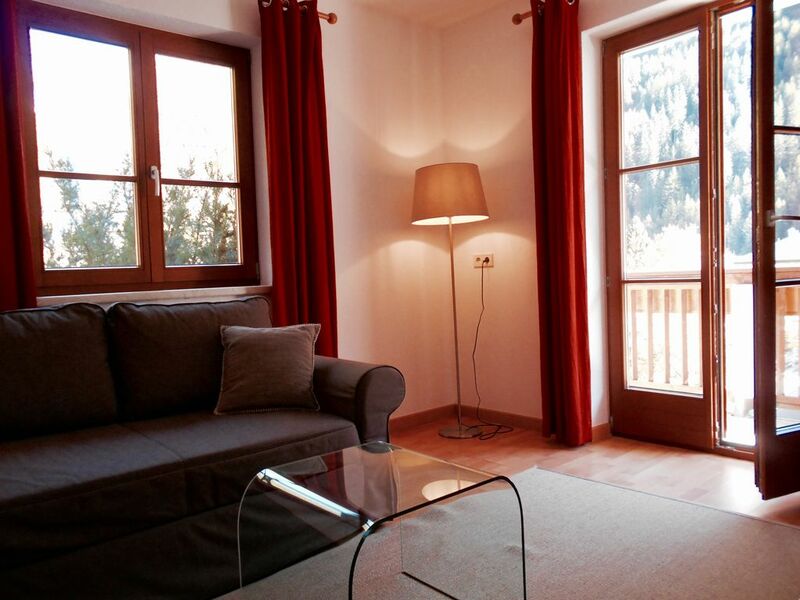 The attractive apartment for 2 - 4 people is located on the first floor of our house in the beautiful Kaunertal. It has a cozy kitchen with table, bench and chairs and a modern, well-equipped kitchen with dishwasher, stove and oven, coffee maker, toaster, kettle and much more. From the kitchen you enter the living room, where a sofa is that can be pulled out into a comfortable Schalfmöglichkeit for 2 people (140 x 200), as well as a TV. The living room leads to the balcony from which you can look gorgeous on the village Feichten and the valley. There is a large bedroom with double bed (180 x 200) and a small bedroom with a single bed (90 x 200). Spacious bathroom with shower, WC and window. Sheets and towels are of course provided by us. Dog by arrangement. We charge a total of 20 € for a dog for the increased cleaning effort. The house has two more apartments. Free ski bus in our beautiful, snow-sure glacier area (about 30 minutes to the slopes). The skiing is usually there until the end of May possible, the ski resort is never crowded, there is no long queue at lifts there. After Serfaus / Fiss you need about 30 minutes by car. The 25 km long cross-country trail starts Kaunertal unmittebar front of our house. For natural toboggan run is only a few meters. Likewise, many trails start just behind our house, leading you to the highest peaks. The Kaunertal is an Eldorado for hikers who love solitude and a nearly untouched mountain world far away from the fair tourism. In beautiful, peaceful Feichten there is a well-stocked grocery store, two sports with ski rental shops, restaurants and bars and a cash machine. Everything is within easy walking distance. In the basement of the house you will find a ski room for your equipment with ski boot dryer. For a dog (by arrangement) we charge 20 € per stay. The Kaunertal impresses with a great and generous nature. Far away from mass tourism, you can relax and let your mind wander. If you are looking loud buzz and party life is out of place here, who looks a magnificent mountain scenery, a unspoilt countryside, cordiality and frank hospitality, just right. At the end of the valley is the Weißseeferner, one of the most beautiful Alpine glaciers. Im Kaunertal they can observe wildlife and experience a breathtaking fauna. The cozy village Feichtenschlager offer you some good restaurants and bars, a bank, two sports shops with ski rental and a grocery store where they get everything they need for your holiday. The pilgrimage site Kaltenbrunn offers one of the most beautiful churches in the Oberland. The Kaunertal offers in winter a wonderful winter sports resort with a snow-sure glacier, toboggan run, many kilometers of trails for cross-country skiing, snowshoeing, indoor pool with sauna and steam room and more. In summer the Kaunertal now is a hot tip for hikers and mountaineers who want off the beaten track to experience a high alpine mountains. Our house is located raised in the village of Feichten, so have a nice view.